Yesterday standing up against totalitarism, today against a power having lost the sense of history, the Hungarians seem to have kept their spirit of revolt intact. Resistant and strong, these anonymous sentinels of democracy regularly beat the pavement in order to maintain their democratic rights. Obviously, the Hungarians are not ready to put away their banners, the whistles and the loudspeakers. For several months, not a week passed without thousands of them taking to the streets of the capital to express their frustration at arbitrary decisions. 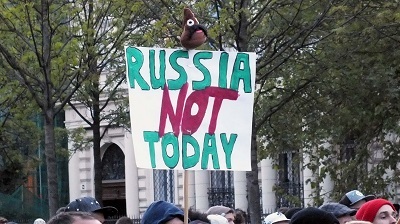 In April and May 2017, the demonstrations unanimously denounced the closure of the Central European University, the obligation for NGOs to declare any funding higher than 23,000 euros from “abroad”, the all-round rapprochement with Moscow, but also the way in which public procurement is managed. 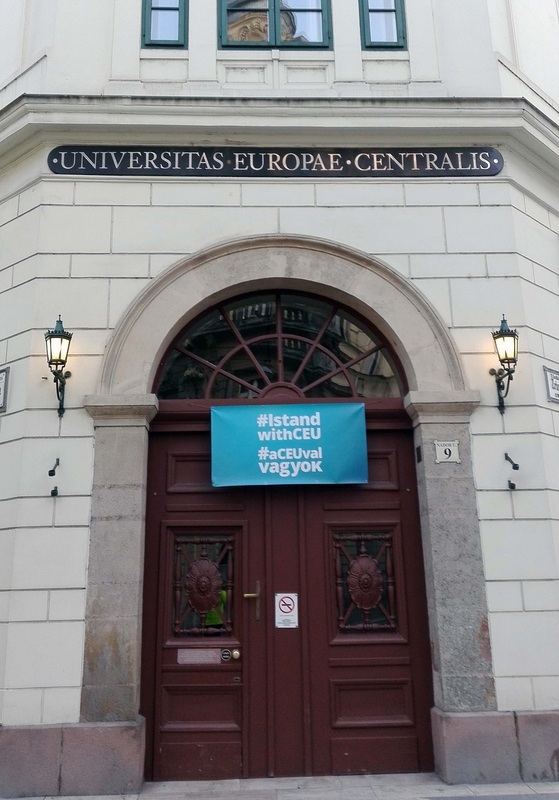 The closed entrance of the Central European University (CEU) financed by the US billionaire of Hungarian origin George Soros. 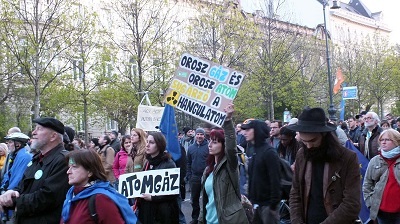 Protestors denounce the law of April 4, 2017, perceived as “liberticide”, according to which foreign institutes located in Hungary should have a campus in their country of origin. Displayed on the door: “I stand with CEU”. On April 24, 2017, in front of the Russian embassy in Budapest, thousands of Hungarians marched by shouting “Budapest is not Moscow! ”. 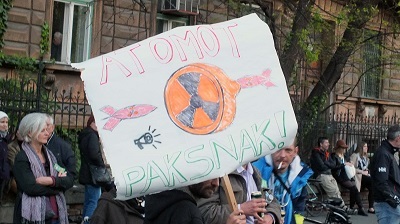 On the placard of one of the demonstrators “Russian gas and atom irradiate the atmosphere ”. “Atomic Paks”, named after the city of Paks where Hungary’s only nuclear power plant with two Soviet-built reactors has been working since 1983. Russia must build two new reactors there before 2023. Trolling over the placard, the moustached excrement incarnates President János Áder, always prompt to sign the laws that are submitted to him. 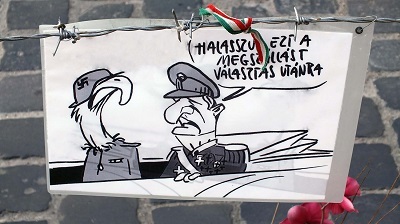 “Let us postpone this invasion until after the elections”: caricature hanging close to the Memorial of the German occupation erected in July 2014 without prior consultation, and still very controversial for the revisionist message it carries (see Assen Slim, “Budapest: Memorial Hypertension”). In front of the Parliament, located in the middle of the Danube where the controversial construction of the diving board for the World Swimming Championships of 28-30 July 2017 takes place. Thumbnail: Header of the Facebook page «Stop Moscow», which parodies the slogan of the national consultation launched by Prime Minister Viktor Orbán just after he signed the Declaration for the 60th anniversary of the Treaty of Rome, «Stop Brussels». 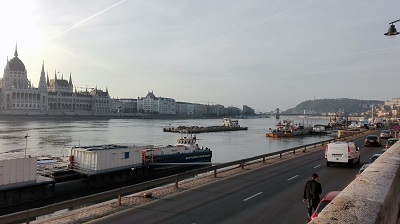 Shortly after 1st April, the Hungarians received a questionnaire in their mailboxes, asking them oddly about their perception of the « diktats » of Brussels. * Assen SLIM is Professor and Researcher at INALCO and ESSCA. See Blog.